In the almost exclusively non-literate culture of the medieval world, the production of a manuscript answered a need to fix and define an oral tradition simultaneously conferring the status of authenticity on the material contained within. The Jacobus, a compilation of writings devoted to the cult of the Apostle James, was such a document. However, it presents a radical departure from the general form of hagiographical texts which focussed on the vita, or life and death of the subject and provided examples of their miraculous powers. Its five books do include a list of miracles but no Vita, perhaps because the legend of Saint James had early been established in apocryphal texts. Rather, the intentions of the authors seem to be twofold. Firstly to legitimise the questionable notion that one of the Twelve Apostles was actually buried in northwestern Spain. This was addressed in Book Four’s History of Charlemagne and Roland, which fused the legend of Saint James’ shrine with the memory of Charlemagne, the most potent and revered of medieval icons. The second concern of the authors is with the pilgrimage itself, since in the case of Compostela more than any other medieval cult, the journey was as, if not more important than the goal itself. The nine chapters of Book Five, the so-called Pilgrim’s Guide, deal comprehensively with this subject. The course of the pilgrimage road had long been be a contentious matter with powerful and sometimes competing forces at play. 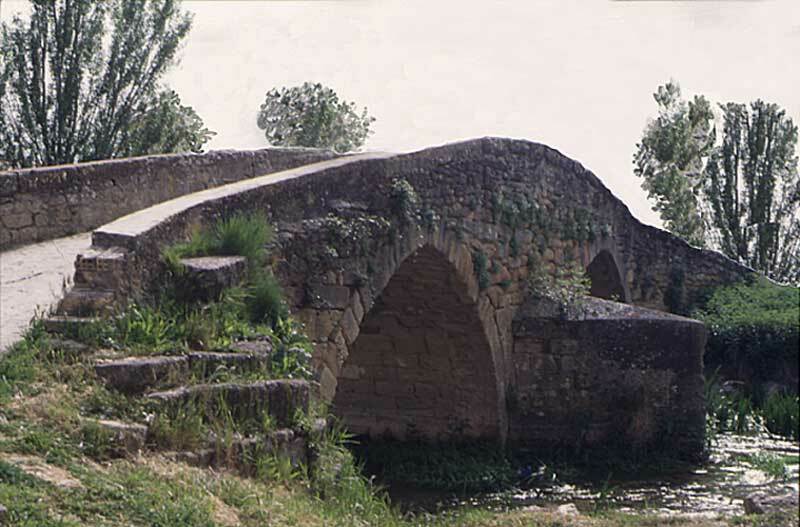 Before the establishment of Estella in 1090, the road passed along a series of monasteries between Villatuerta and Irache. Among these was the priory and pilgrim hospital of Zarapuz, belonging to the powerful abbey of San Juan de la Pena. The existence of the new town meant that the route now moved away from Zarapuz, to the detriment of San Juan, whose monks bitterly complained to no avail of the rights granted to Estella. Similarly, the important monastery of San Millan de la Cogolla was not favoured when pilgrims were directed to Najera. The monks were obliged to go there to solicit pilgrims on the road to make a detour of nine miles to the remote abbey in the Sierra de la Demanda to visit the relics of their saint Emilianus whose cult was now forced into a comparative decline. At the end of chapter III the author claims his intention is to provide information which will give pilgrims an idea of the expense involved in their prospective journey to Compostela. Yet in performing his task, the author has at the same time fixed the definitive route of the pilgrimage road to such a degree that this may actually have been his intended purpose behind the manuscript compilation. Variants of the pilgrimage road were not eradicated, but at some point in the middle of the twelfth century, the author of the Jacobus set down in writing what had partly been a growing popular tradition and partly the enforced will of royalty and the Church. It came to be known as the Camino Frances.